Photo courtesy of Remain L.A.
Over the past 4 months I have had the opportunity to study several of the great contributors to education. Among them is the well known Paulo Freire who criticized traditional teaching methods such as the banking method which focus on teacher centered education. Back in Korea while I was teaching ESL, my classrooms were beautiful and the YBM facilities were well kept. A flat screen TV was usually available at any time and our rooms had modern glass walls that connected us to the outside world. I could never have imagined teaching without such a well equipped classroom. That is, not until I read an article about teachers in Guatemala bringing their classrooms to wherever the students were located. In the article titled, "In Guatemala: School is where the children are" I learned about teachers that were providing education for young children at their parents mercados and merchant stands during the day. Without any access to education, these children were usually found working alongside their parents trying to make enough money for daily necessities. Inspired by the ideas of Paulo Freire, a program was created to teach these children how to read and write bringing them hopes of succeeding in their growing society. The program did so all while getting support from the parents of the children. The article which supports humanitarian education in a poor Central American Country is not far from home as such educational opportunities are happening right here in the United States. A blog Remain L.A. wrote about an ESL teacher in Los Angeles that holds ESL classes in a Home Depot parking lot. English Teacher Finds an Unexpected Classroom shows the struggle of immigrant workers in the United States fighting for literacy. 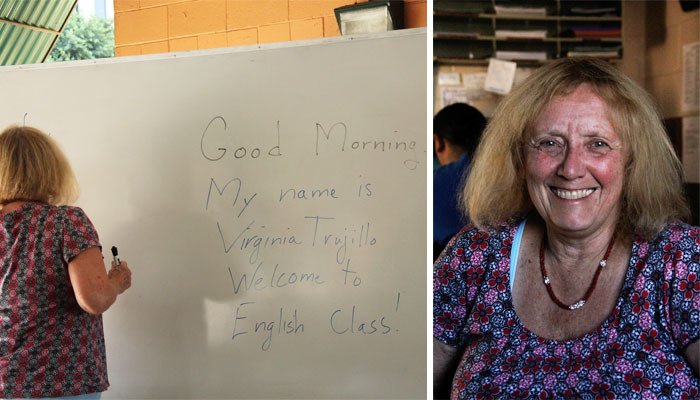 When teacher Virginia Trujillo's high school English class was cut, she found herself teaching English as a Second Language to immigrant workers at Home Depot to help persuade the L.A. school district for further funding. Her fight for funding was successful, but she will always remain teaching outside of the classroom in MacArthur Park for those that want to join her class. Education is the first step in the fight to end poverty. The next time one of my white board markers runs out of ink while teaching a class, I'll have nothing to complain about. I salute ESL teachers because they're like private tutors but they do intensive teaching. I once did ESL teaching and it's very satisfying once I realize that my students learn something from me.